The biggest British Columbia cities tend to be huddled around the southwest region, with Vancouver being the most populous. At two and a half million people, the Greater Vancouver Area comprises roughly half the province's population, so you can imagine the remaining cities are not big by North American standards. Nevertheless, the most popular British Columbia cities all have their unique charm, situated close to stunning natural landscapes and are gateways to adventure. Often mistaken for the provincial capital (which is actually Victoria) Vancouver is the best-known and most populous city in British Columbia. Vancouver is a physically beautiful city, surrounded by water and mountains. Its proximity to nature appeals to a population that is laid back and friendly. Vancouver often garners praise as one of the world's most livable cities. The provincial capital on the southern tip of Vancouver Island, Victoria is a harbor city rich with history but still progressive and modern. If Vancouver is BC's ambitious shining star, Victoria is the equally talented but more stately and discreet older sibling. Being more remote, Victoria has both its advantages and disadvantages. Vancouver Island has a special island charm but of course, takes a little extra effort to get there. Hop a ferry from Vancouver or splurge and take a seaplane/ferry (check prices) or a Helijet helicopter. Don't stop at just Victoria though. Try to give Vancouver Island two or three days. You won't regret it. Whistler has been known to winter enthusiasts for decades but the town's reputation skyrocketed as co-host of the 2010 Winter Olympics. The year-round resort town also offers mountain biking, hiking, and zip lining and is host to a film and food festival. Part of the beauty of this BC town is getting there. The Sea to Sky Highway that connects Vancouver and Whistler is one of Canada's most beautiful drives. Ok, so "gem" is an overused term in travel writing, but this time, we really mean it. Remote and scenic, Tofino sits at the southwestern edge of BC, offering big-time views of the Pacific Ocean with small-town charm. Go whale-watching, storm watching, surfing, hiking, or just put away your cell phone and soak up the laid-back atmosphere of this great BC city. Nestled between two lakes in the Okanagan Valley, Penticton is probably most famous as the starting point for wine-lovers exploring the region's wineries. The area around Penticton is popular for scenic drives, wine-tasting, golfing, mountain biking, and climbing. Sitting just north of Penticton is Kelowna, the largest city in the Okanagan Valley. The long warm summers and short mild winters draw tourists year-round for biking, wine-tasting, swimming, skiing, snowmobiling, and more. The Kelowna International Airport (YLW) has daily flights to and from North American destinations. Like Victoria, Nanaimo is located on Vancouver Island and is a ferry ride away from Vancouver. Alternatively, you can fly by plane or helicopter. 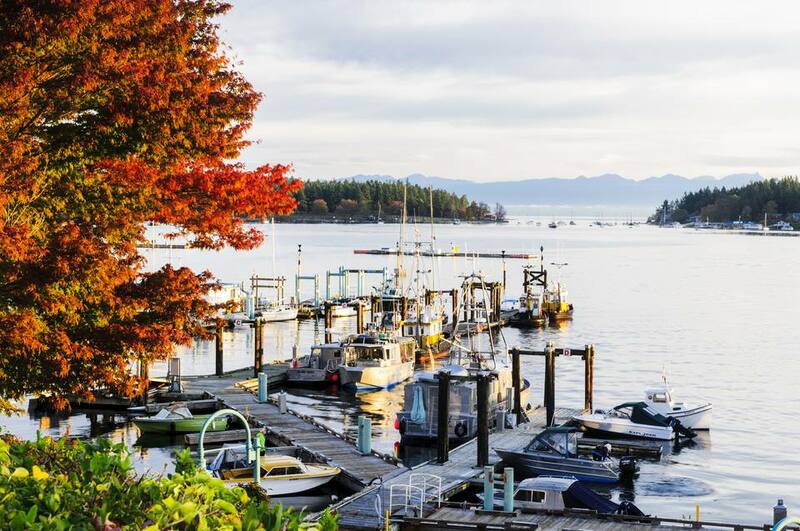 Nanaimo is one of the natural entry points to Vancouver Island and offers plenty in the way of swimming, scuba diving, hiking, and more. Nanaimo is also namesake to the creamy chocolatey dessert square, Nanaimo bar. Situated on British Columbia's north coast, Prince Rupert is especially attractive to adventure seekers and outdoors enthusiasts. Prince Rupert, like much of BC's northwest coast, has a rich First Nations history evident in its art, architecture, and peoples. Any mode of transport to Prince Rupert will be scenic - choose to get there by ferry, train, car/bus or plane. Located in BC's interior, with a population of 12,000, Williams Lake is a natural hub for several scenic tours, including historic Gold Rush Trail, the Coast Cariboo Circle Tour, the Fraser River Trail, and the Lakes and Trails Circle Tour. A large, modern tourist center, built in 2005 will give you plenty options for accommodation (a dude ranch perhaps?) and things to do, the most popular of which are mountain biking, fishing, and whitewater rafting. Host to more tournaments than any other city in Canada, Kamloops has the facilities and hospitality industry to welcome thousands of athletes and spectators each year. In addition, Kamloops boasts 2,000 hours of sunlight annually, decreasing the chances that poor weather will wreak havoc on your vacation. Things to do in Kamloops include hiking, cycling, wildlife viewing rock hounding, and fossil hunting. Only 45 minutes from Kamloops, Sun Peaks Resort boasts the second-largest skiable terrain in BC and is renowned for its light, dry powder.